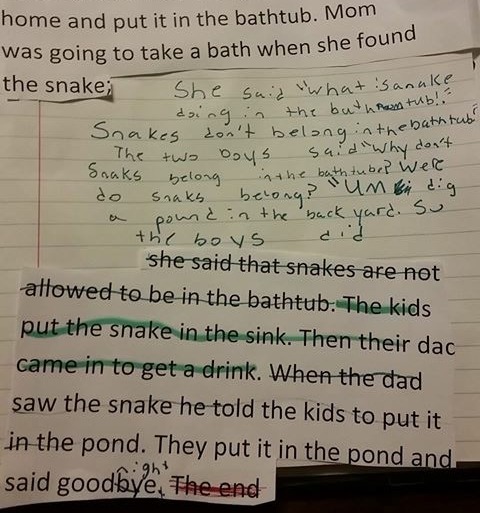 My third-grade writers seem to have great intentions when it comes to adding dialogue to their pieces. However, those attempts often feel flat, full of errors or they just plain forget to put any into their writing. This past week we spent a lot of time thinking about ways we could add dialogue as well as the proper way to punctuate. We started by looking at examples of dialogue in books we were reading. Students copied down examples of dialogue and we shared those examples with each other. 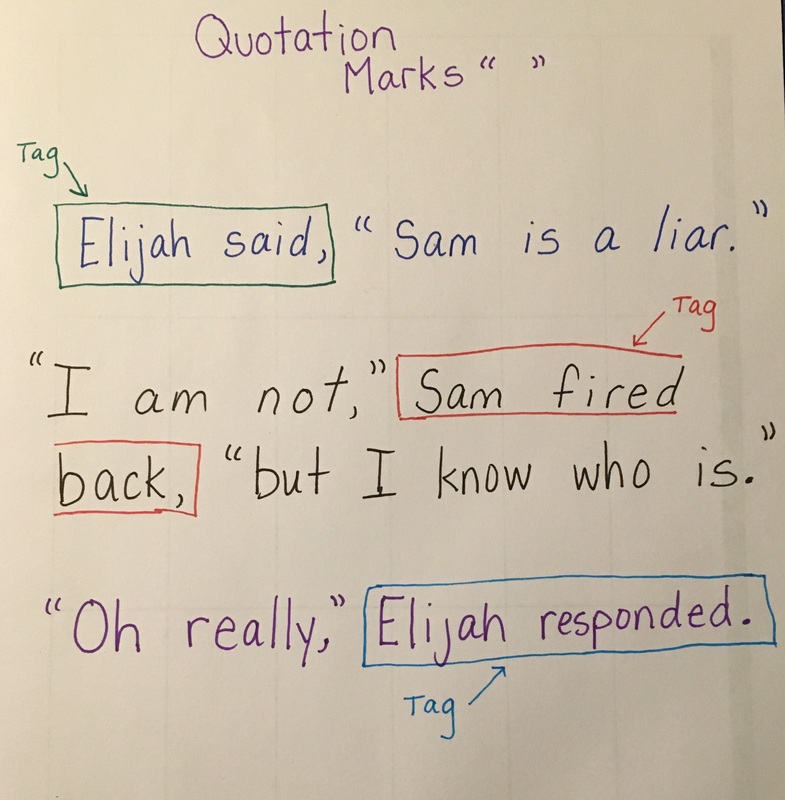 We noticed things like where do the quotation marks go, commas, tags, and other conventions. I made a chart of some types of dialogue examples we found to be most common and then students went to look at their own writing to see what changes they could make to correct the dialogue in their own stories. The next day I presented the students with a story that lacked any dialogue but had obvious areas it would likely fit. 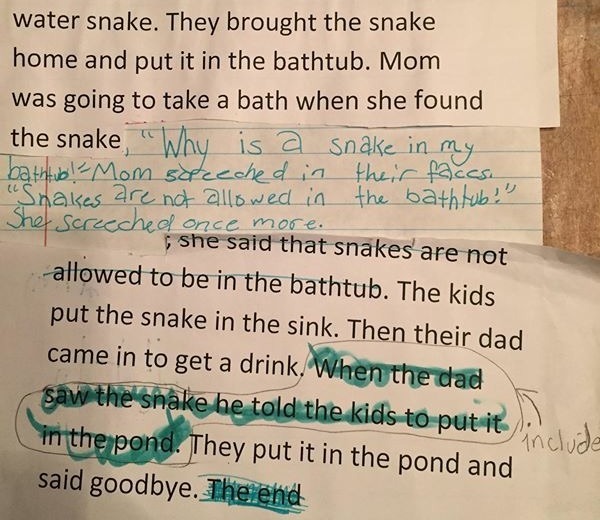 Students cut up the story adding their own conversations. They really enjoyed this and sharing our work at the end was interesting as students noticed the way the many different conversations changed the original story. I promised the kids we would try this again in the coming week. I’m hoping that by getting in a groove with adding dialogue and finding ways to include conversation intentionally in their stories it might become a more natural detail they find themselves gravitating toward instead of avoiding altogether. 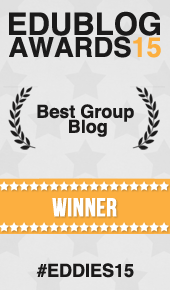 ← Waving the White Flag on Valentine’s Day! Did you write your own story that lacked dialogue or did you use one that was previously published? I just did a similar lesson with students using a student mentor text, but would love to have other examples, too. This is a great idea, and I’d love to try this with my 6th graders. Do you have a link to any resources so that I don’t have to spend countless hours typing up stories? Love this idea and want to try it with my third graders! It’s cool how the story changes based on the different dialogue. Fun and useful idea! Wonderful that they are writing their own dialogue rather than correcting someone else’s sentences. This exercise also gets them thinking about the places where dialogue works best. I bet they are enjoying it, also! Looks like they are taking on the learning. It’ll be exciting to see what they try in their own writing pieces. Excellent modeling of the process! Thank you for sharing this! Students either write a whole page of dialogue or none at all. I like to tell them to sprinkle it in, like salt or a spice…too much tastes horrible, too little, you can’t taste, but the right amount enhances! !